Shawntel and B-Nelson Heading towards the second sled hill. An old Sabah teammate and friend, Jon Stadlin, is working with a group of kids called the Y Explorers that teaches kids about the Earth. They asked what we do for fun. This post is for them, specifically Daniera and Nadina. Unfortunately, there is no way that these pictures will do the experience justice. The Castle Rock loop is about 9.3 miles round trip, but only 3.6 miles to the rock. We hauled a sled that is normally used to haul materials up to the rock. From there, we were able to go on the first of the two best sled rides of my life! Shawntel, Brian, and I hopped in the sled and came flying down the hill found in this old blog picture. Just follow the flag line and you'll see where we went and pretty much stopped. We all had to lean together like a bobsled team to steer where we were going. I was pretty amazed at how far we had gone, probably over a half mile. However, the best fun was still to be had. 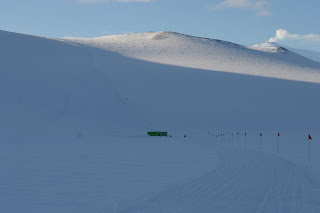 The big sledding hill (and the Kiwi ski hill on the left)! With a few attempts at sled surfing along the way, we moved the sled down to the next hill. This hill was a lot steeper and longer. The kiwis use part of it as their ski hill. The big trick about navigating this hill was that we had to follow the flag line. 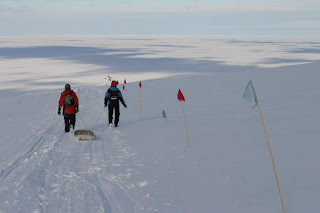 We have to follow the flag line whenever we hike in Antarctica because it marks the safe walking routes. If we left the flag line, we could fall into a crevasse. If you enlarge the picture above and look closely, you can see a set of vertical flags. There are also a few very hard to see ones one third of the way down that marks the beginning and right side of the Kiwi ski hill. Two-thirds of the way down, near a bunching in the vertical line, is a very hard to see horizontal flag line that marks a crevasse. With all of the above in mind and plans to bail out if we got to far off course, we set off on our journey. We started from a spot just out of sight in the picture above. I was in the front and we started off slow. As we reached top speed, we couldn't steer quite as well and got a little off course. Brian dug his hands in the snow to get us back on track and we slid safely down to where the building was. It didn't feel safe though. It was scarier than the front of any roller coaster I have ever been on. We might not have gone as fast as a roller coaster, but we didn't have the same safety equipment either. I can't wait to go again. 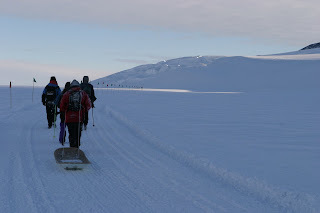 Walking back to base after the best sledding EVER! hahahahahahaha i love this post, simply because you survived a crazy stunt/adventure. what a ride!